The Seattle Symphony will perform seven free Community and Side-by-Side concerts during the 2017–2018 season. If you can’t make it to Benaroya Hall, the Seattle Symphony might be coming to a neighborhood near you. This season the Seattle Symphony will perform seven free concerts, including two free Community Concerts with cellist Seth Parker Woods on October 18 in Des Moines and October 21 in Tukwila. On March 15 Music Director Ludovic Morlot and the orchestra will perform a free Community Concert at the University of Washington. The program includes two world premieres and celebrates Morlot’s time at the Chair of Orchestral Conducting at the University of Washington. The concerts are part of the Seattle Symphony’s ongoing commitment to broaden accessibility to arts programming and build lasting relationships with communities throughout the region. 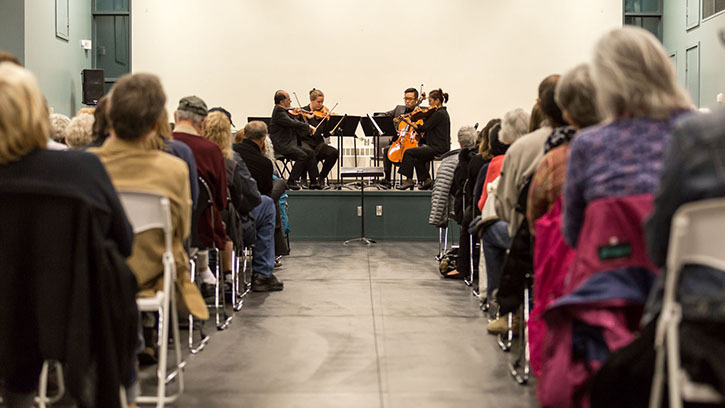 Community Concerts also include special performances as part of the Seattle Symphony’s Simple Gifts program, which seeks to empower individuals experiencing homelessness or housing insecurity to connect with their creativity. This season Seattle Symphony Composer in Residence Derek Bermel will work with veterans experiencing homelessness from Compass Housing Alliance’s Shoreline Veteran’s Center to create a collaborative composition. Their music will be performed by Seattle Symphony musicians at a free concert open to the community on May 11 at Benaroya Hall. In addition to Community Concerts, the Symphony will perform three Side-by-Side Concerts with the University of Washington Orchestra on January 25, the Ballard Civic Orchestra on February 15, and the Ballard High School Orchestra on March 1. Side-by-Side Concerts provide a valuable opportunity for students to perform alongside professional musicians and are part of a continuing tradition of coaching and mentoring young musicians from local high schools, universities and community organizations. Please join the Seattle Symphony for these free Community Concerts in your neighborhood this season! Thanks to our generous partners, and people like you, the Seattle Symphony is able to share the transformational power of music through Community and Side-by-Side concerts. Not a member of our donor family yet? Join us today! The Seattle Symphony’s Family, School & Community programs are supported by 4Culture, Aetna Casualty & Surety, Alaska Airlines, Citi Community Capital, the Educational Legacy Fund, Hot Chocolate Fund, Moe and Susan Krabbe, the League of American Orchestras, Richard and Francine Loeb, Kjristine Lund, the Merriman Family, Music4Life, Music Works Northwest, the National Endowment for the Arts, Peach Foundation, the Peg and Rick Young Foundation, Seattle Pacific University, the Seattle Office of Arts & Culture, Seattle Symphony Volunteers, the Sheri and Les Biller Family Foundation, Christine and Michel Suignard, Atsuhiko and Ina Goodwin Tateuchi Foundation, Ten Grands Seattle, Tulalip Tribes Charitable Fund, the U.S. Bank Foundation, UW Autism Center, Weill Music Institute, Wells Fargo Foundation, the Wilson Sonsini Goodrich & Rosati Foundation, the Wyman Youth Trust, and individual contributions to the Seattle Symphony Annual Fund.